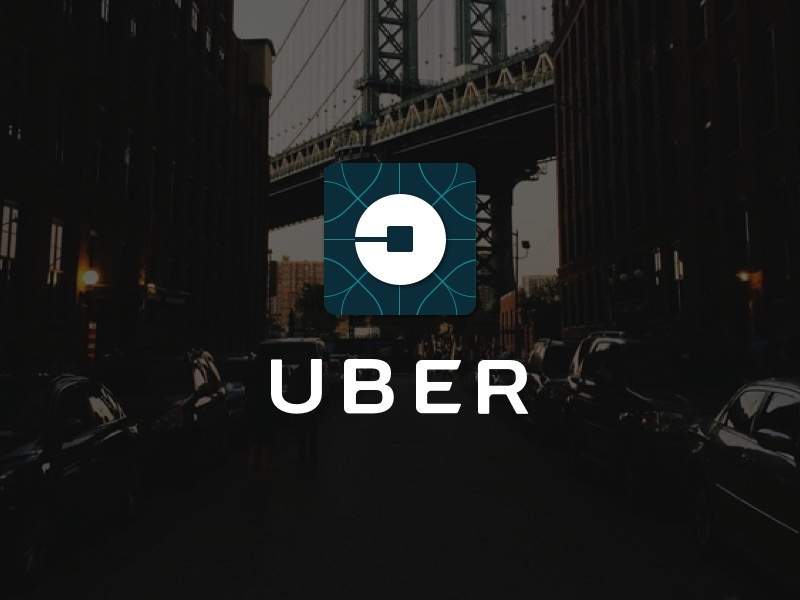 I’ve been picked up multiple times by Uber, I’ve been using Uber a lot lately because my Mama is comfortable with it and like it more than getting on a taxi that usually complaints when we go home – because our place is too far away from the main city. Uber driver don’t usually complain with the distance. I’ve been picked up here at home multiple times, if I remember it right more than 5 times already. Let’s say out of 5 the 3 Uber got lost and what I usually do is that when Uber let me know it’s near I go outside the house to wave at them. There was even once when the driver though we’re at the other subdivision, and he stopped there, when we’re on the next subdivision. He have to call me and I texted him since I was wondering why I can’t see him entering the subdivision yet the Uber app is telling me he’s arriving and he says he is arriving. He wasn’t able to follow the map well because the mobile internet he have is not that good, and it turns on and off. I always suggest to follow the map, since usually they only get lost on which road to turn inside the subdivision. At least I could see them and wave at them. Some people find it complicated when I explain to them on how to get to my place, so the map is very important when I want to be picked up at my place. 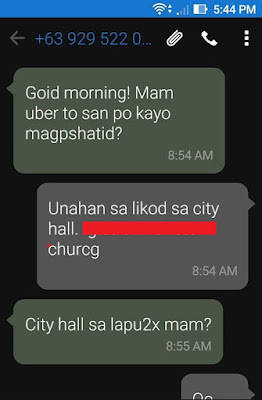 So just today, I requested for an Uber to go to church. I requested it about 40 minutes or so before the church service since there are times that the Uber we’ll get is more than 10 minutes away and it takes about 30 minutes or so to get to the church. Driver: Good morning Mam! Mam this is Uber, where are you going? Me: After the city hall, at the back. 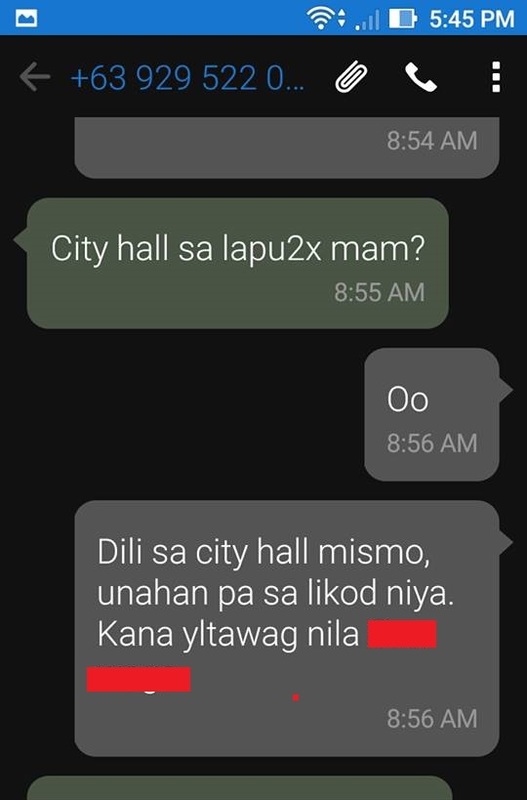 Driver: Lapu-Lapu City hall Mam? This gave me a sign that the driver is not that interested and concerned where to go. I do understand though, since there are some that who prefer riders going to Cebu city since there are more riders there. And there are some in my experience, they don't like going in some areas. Me: Not in the city hall though, it's at the back of the city hall. It's after the back of the city hall, they call it (location). Let me blur the locations. I hope you understand. 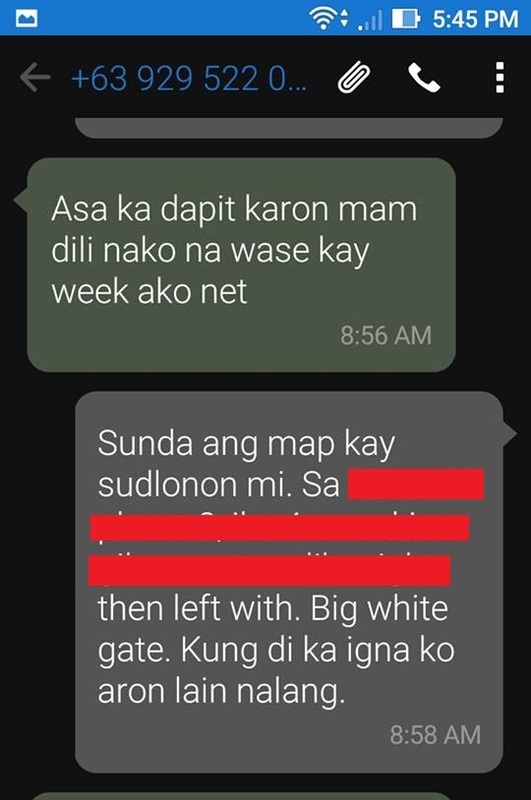 Driver: Where are you now mam?I dont want to WASTE because my internet is weak (he means weak, not week). Me: Just follow the map since our place is hard to find (sudlonon means it's the very inside that you'll find it hard to find). (Location Stated) then there's a house with big white gate. But if you don't want to, just tell me so I can go for someone else. 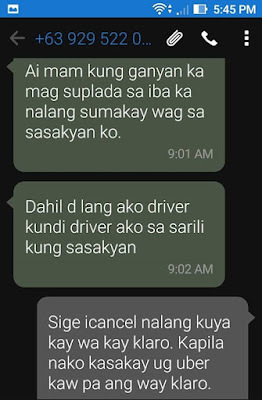 Because in the first part of the text message, he sounds like he prefer someone going somewhere he needs or want to be, I gave him the option to cancel. It's just plainly saying that I won't mind if you cancel - since I have more time to wait for another Uber. Please note, that by this time, his location on Uber app is not moving at all. Still showing 10 minutes to arrive even though it's been more than 5 minutes, and I can't cancel the trip anymore. Well, I can, but for a fee. Driver: If you're like that mam, a snob, have a ride with someone else. Don't ride in my car. Driver: Because I am only not a driver, I am driving my own car. Me: Okay, you may cancel it Kuya since you're not being clear at all. I've tried Uber multiple times, and you're the only one who's not clear. I am very much aware that these Uber drivers, are mostly owners of the cars. Which what I actually like, because it means they're professionals, they have manners, they know how to deal with people, and majority are respectful. We used to have a driver before, I was never disrespectful with our drivers, or our house maids, because my parents DID NOT raise my that way. Parents of my classmates even who live in a squatter area like me a lot because I am not choosy with friends, or choosy with food, and I respect them like how I respect my parents. This text message does not stop there. It stops around 9:30am but it's him who keeps on sending me a message. When I checked my phone around 11am, I have 7 messages from him, all rants, rude messages, and just insulting me. 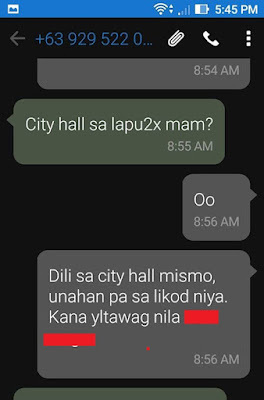 The Uber driver even said that I should report him, even report him to Tulfo. Well, challenge accepted. I don't know Tulfo though, but I am reporting him to Uber hoping this driver will be removed. Why? 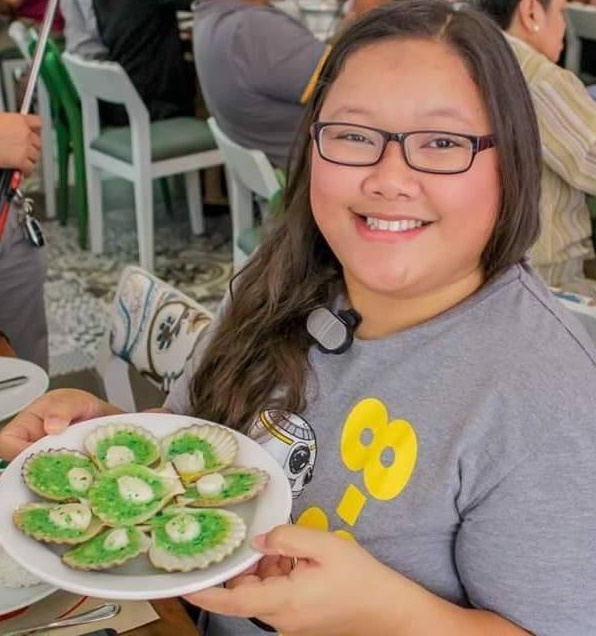 My Mama and I LOVED (past tense) Uber because we're not getting those kind of taxi drivers who complaints because we're far, drivers who ask for some extra tip, and drivers who are disrespectful. But with this, it's a HUGE disappointment. Will we be using Uber again? I am not sure anymore. He was not moving on the map for more than 5 minutes, and usually that kind of driver who asks where you’re going is weighing in if they want to pick you up – and yes, I’ve experience this kind of driver too and he canceled the trip when he find out where we’re going. I did give him instructions but advice him to use the map, and since he sound like not interested, I gave him the option to cancel if he don’t want to since I don’t mind waiting for other Uber available. But I don’t want to cancel it myself since it’s been more than 5 minutes, and I’ll be charged with P100 when he is the one who seem not to want to pick me up. If you think about it, I wave at the driver and wait for them outside because there has been some reports that in the subdivision, there are holduppers. So if you open your window to ask, or if you're a taxi thinking that this person is a prospective customer, you can be a victim. There are 3 houses here that was raid as a drug den, 2 drug pushers few houses from my place, and a number of pushers. I even instruct any taxi driver who brings me home not to open or pick up a customer in the subdivision since it can be dangerous. Plus, he may get lost in this area, a lot of taxi drivers get lost here, even tricycle drivers who have been here multiple times still get lost. That's why I suggested to follow the map. Was I SO RUDE to give him the option to cancel that I deserved to be insulted? If I sound rude, I didn’t mean it that way. Because I do understand that some drivers want a trip going to the main city so they can get more rides there, since there are just few riders here in my area. I hope you’ll train your drivers. Give them seminars before they start, though I didn’t mean to be rude if you do think I was rude, there will be a lot more riders there that they’re actually being rude. And they’ll act like this? Nonstop text? Good thing I just ignored him, if not then we would be ranting all day. Provide them with trainings that will let them know how to act on rude riders, if I was really rude, they shouldn’t be acting like this. They should just shut up and move on! Let the riders cancel the trip with a reasonable reason. If I was given the option to cancel without a fee when he asked where he’ll be picking me up, I actually tweeted Uber first before replying. I am not happy with the intro of the driver, my instinct gave me that this driver will not be pleasant to ride with. So, if I was able to cancel that without a fee, this won’t be like this. Uber Drivers not using the internet? How will I know if he arrive if he's not online? How can I wave at him? You should inform your drivers to do use the internet so we'll be all aware. Remove drivers like this. My mother said he’s so impolite that he shouldn’t be on Uber, or public service. Let the Uber driver know where they're going on the first hand. I've found out a week after I've been using Uber that they don't have an idea where they're going until they're able to pick up the rider. I understand why drivers are picky with locations, and I don't want to ride on a car with a driver who complaints where we're going. Add an option to BLOCK the driver. I want to block this driver if you won't remove him as one of your Uber drivers. I can't find that option, if you know let me know. *Update as of October 21, 2016 - Uber blocked him on my account so I wont show up. So if you want to block an Uber driver, contact them. Don’t read the text messages the way you feel. If you feel pissed, and read a message while you are pissed, then it will sound like the customer is pissed. Before you reply, before you get angry. Be calm, and read it again. I’ve been there too, but I’ve learned my lesson, I always read more than 5 times the messages I get before I reply and understand their situation before insulting them. If you have a (real) rude customer, then just cancel and move on. Don’t waste your time and your high blood pressure on sending rude messages.